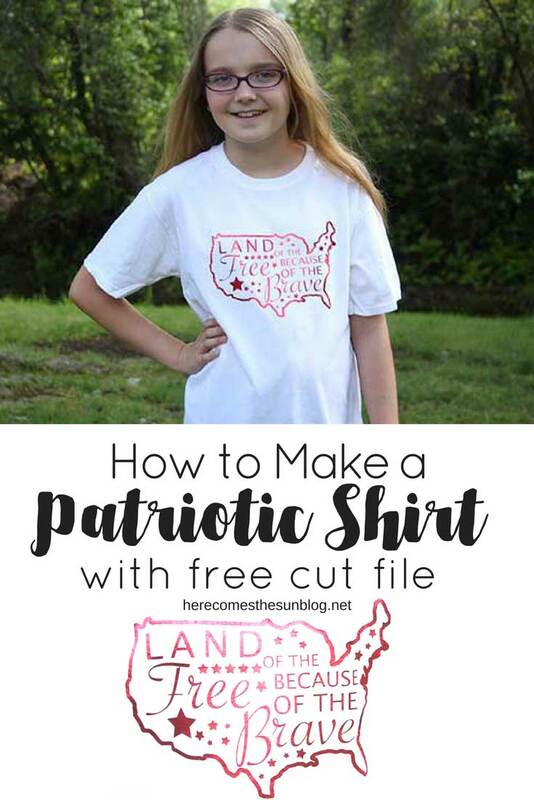 Learn to make a fun and festive DIY patriotic shirt with this easy tutorial. Memorial Day is quickly approaching and I’m looking forward to that 3 day weekend. Memorial Day means our annual cookout with friends and this year I’m even more excited for it because we have a sweet entertainment space in our new home. But Memorial Day really isn’t about a 3 day party weekend. It’s about honoring our service men and women. 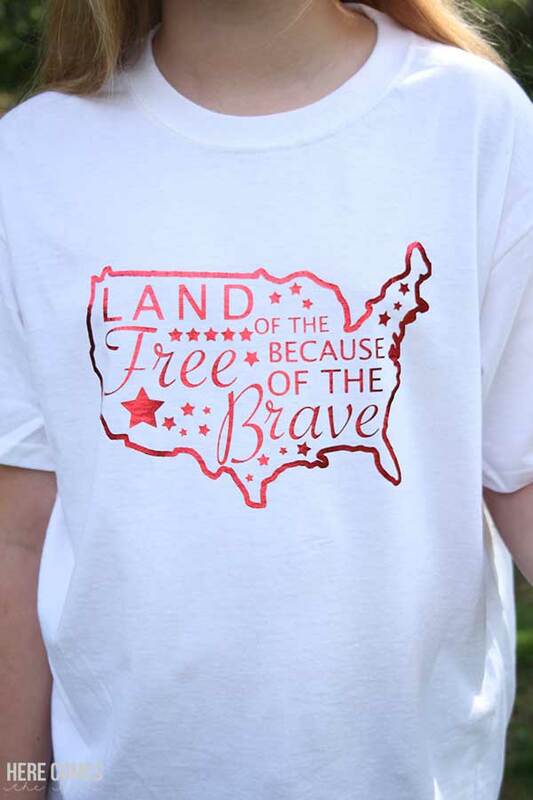 So today I decided to make a DIY patriotic shirt for our holiday celebration to honor them. 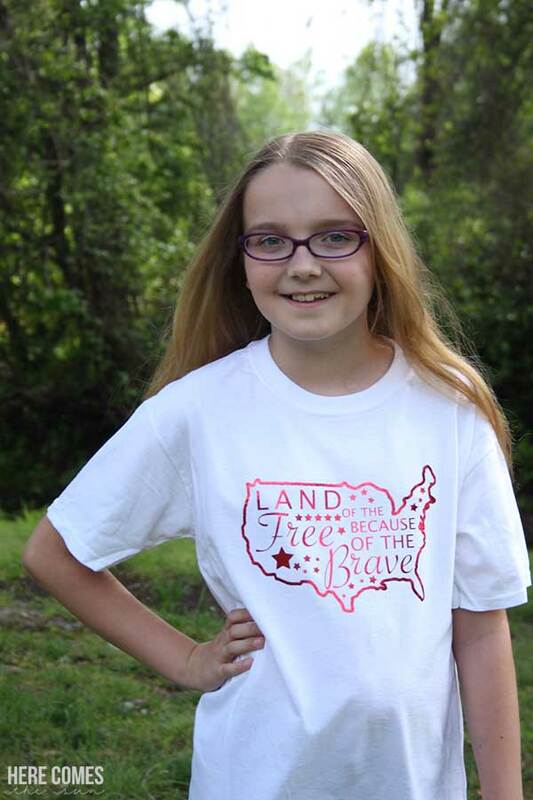 If you are planning to make patriotic shirts this year, you’ve come to the right place. Land of the free cut file. You can access it in the resource library, below. 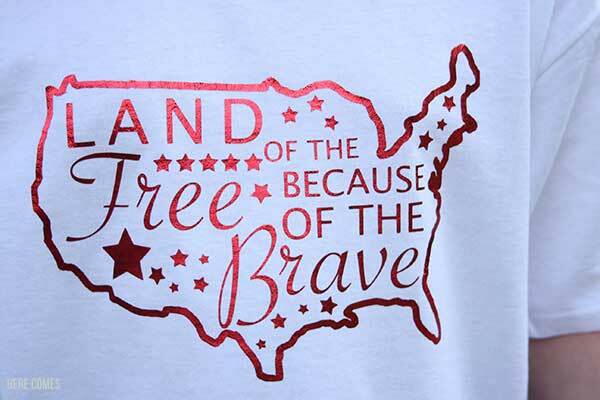 One of the things that I love about this design is that it can be used to make Memorial Day shirts or Fourth of July shirts. I’m all about things that do double duty. First, download the free cut file. This is an SVG file and can be opened on both the Silhouette and the Cricut. (Note: the SVG file that you download will look slightly different than the one pictured. I realized after I took these photos that Michigan wasn’t cut properly. Your file will show Michigan accurately). Next, cut out the design onto red foil heat transfer vinyl. Remember to mirror the cut file before you cut it and place the the vinyl on the cutting mat with the red side down. To weed the vinyl, use the weeding tool (it looks like a hook) to grab the vinyl on the outside of the US outline and peel around the outline. Then, carefully peel away the vinyl inside of the outline, making sure to also peel away the insides of the letters that have holes. When you are done weeding, you should be left with the vinyl design attached to a clear backing. To adhere the vinyl to the shirt, center the design on the shirt and place a thin towel or pillowcase over it. Set your iron to the cotton setting and iron each section of the design for 20 seconds. Test to see if the vinyl is adhered by pulling back the clear sheet. If it is not sticking to the shirt, iron for 20 more seconds. You can also use a Cricut Heat Press instead of an iron to adhere the vinyl. When you are done ironing, peel back the plastic sheet to reveal your beautiful new patriotic shirt. I’m in love with the red foil! I think it really adds a lot of pizzaz! So tell me, do you make shirts for different occasions? What is your favorite type of shirt to make?